DURHAM – A firefighter suffered second-degree burns on his hands battling a blaze early Thursday morning. The Durham Fire Department has taken delivery of two Sutphen custom pumpers. 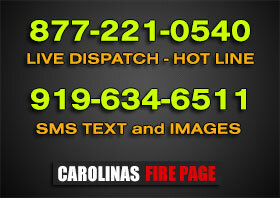 DURHAM – Fire heavily damaged an apartment above a downtown pizza shop early Monday. DURHAM – Fire gutted an apartment building at the Royal Oaks complex Monday, destroying or damaging at least 18 apartments and leaving 35 to 40 people homeless, according to the Triangle Red Cross. DURHAM – A Durham woman is fighting for her life after being trapped in an apartment blaze early Friday evening. DURHAM COUNTY – County officials have been asked to take over the Bethesda Fire Department because it can no longer make ends meet. DURHAM – Daniel Curia, interim chief of the Durham Fire Department since December, has been named new permanent chief overseeing the city’s fire and emergency services.